"When one door of happiness closed, another opens, but often we look so long at the closed door that we do not see the one that has been opened for us." We found out on Clarissa’s 10th birthday just before Christmas 07’ that she has a stage 3 anaplastic astrocytoma located in the center of her brain. Clarissa passed away 5 months later on May 23, 2008. We traveled 90 miles to Salt Lake City for 42 days of intense chemo and radiation without success. She amazed everyone with her courage, kindness and never once complained. It is an honor to be called her father as I learned more from her than she can ever imagine. We wish to thank everyone especially friends, family, employers and neighbors for your thoughts, prayers and kind acts. We also wish to thank the individuals and organizations of: Primary Children’s Hospital, Make-A-Wish Foundation, Macey’s, Associated Foods and Providence Elementary. Your acts of help and kindness have changed our lives for good. 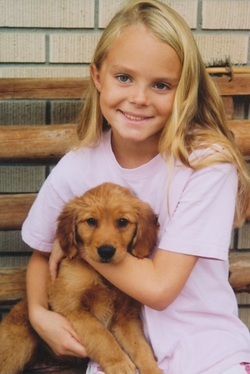 Clarissa loved golden retrievers and especially puppies. Clarissa loved to be outside. She loved to walk in the fields with Sheila, Ruby and me. 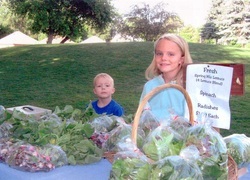 She loved to garden and sell her home grown lettuce and our Jam & salsa at our local farmers markets. She is sorely missed and often thought of. The tenacity and wonderful demeanor of this 10 year was something to experience. Each spring our local elementary schools involve the kids in a 1 mile race named the “Wellsville Mile” It’s designed to promote health awareness and exercise. Clarissa was not to be denied and emphatically insisted that she run the race! Bound to her wheel chair, she asked us to stop the last 30 yards so she could walk to the finish line. With her mother’s arm extended, she walked the last 30 yards and crossed the finished line as an inspired crowd looked on. Hardly able to stand, sick, weak and swollen, she passed away in her parents arms a few days later. Clarissa Packer, 10-year-old daughter of Jed and Kristen Packer, passed away at her home on Friday, May 23, 2008, after her courageous battle with cancer. She was born December 16, 1997, in Logan, Utah. 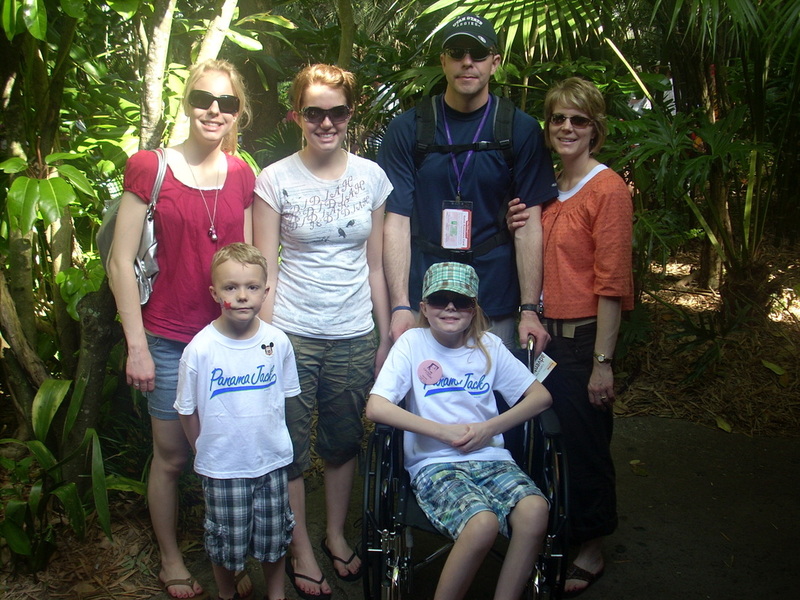 Clarissa was a beautiful, happy, compassionate and determined child. 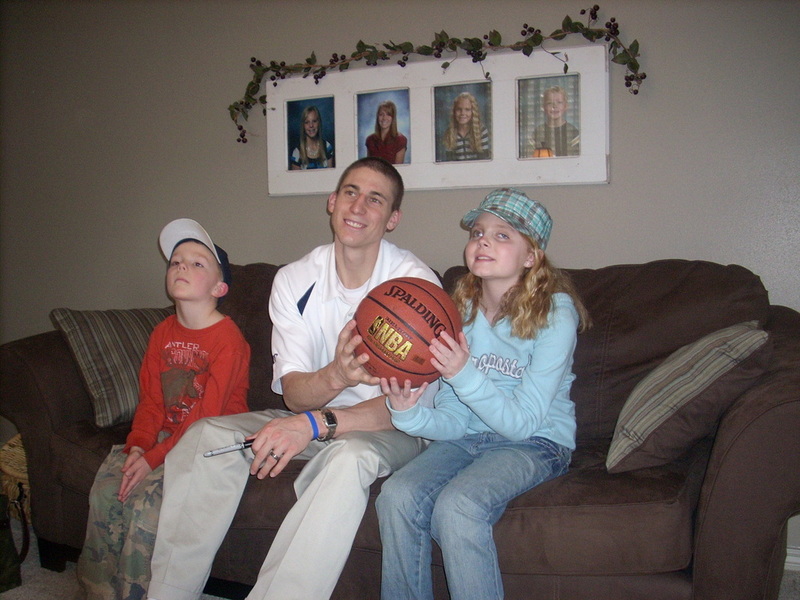 She loved being outside, playing with her dogs, helping her dad in the garden, and playing soccer. Clarissa loved chocolate ice cream, hot waffles, mashed potatoes and playing games with her family. Her family were her best friends. Clarissa attended Providence Elementary and loved all of her teachers and classmates. She was a member of the L.D.S. Providence 12th Ward. Clarissa was a very spiritual young lady. She loved Primary, her teachers and friends. The Primary songs brought her comfort and joy throughout the last few months. We express deepest appreciation to Dr. Meeker, Dr. Thompson and the Radiation Therapy Staff, Primary Children's Medical Center, The Make A Wish Foundation, Associated Foods, Macey's and the Gardener's Market. The community has been wonderful and generous in providing fundraisers and support. We extend our heart-felt thanks to our family and friends for their love and compassion. Clarissa is survived by her parents, Jed and Kristen Packer; sisters, Chalyce and Jocelyn, and her younger brother, Carson; grandparents, Bryce and Valoy Packer and Darrel and Karla Gibbons, and aunts, uncles, cousins and friends. She will be missed by all who knew her. "Don't think that some tomorrow you'll see God's Light. You see it now or err in darkest night." June 09’ Update: Thanks to Mrs. Anderson and a host of others including Providence Elementary, Clarissa’s memory has been captured by her wonderful 5th grade school teacher! Through generous donations and Mrs. Anderson's procurement of a grant, Providence Elementary has created and dedicated a wonderful outdoor classroom in behalf of Clarissa named “Clarissa’s Classroom”. Dedicated to our children that have fought and suffered from cancer. The new outdoor classroom includes a human sundial, discovery center, several beautiful plants and of course, a garden center. 2009 Update: Providence City completed and named a soccer field after Clarissa #14. Clarissa Packer Field includes a memorial bench with Clarissa’s silhouette, a children’s park, soccer field and walking loop. As a parent the loss is tremendous, but having kind people memorialize our daughter’s life is humbling. Thank you! Would you like to read Clarissa’s incredible story?